What is the Most Common Vowel in English? The Schwa. This tiny, reduced vowel is most commonly heard in English. And guess what, there is no written symbol for it in the English alphabet. It can be represented by any vowel. In these 2 syllable words the same vowel is used twice. However, the pronunciation of each vowel is quite different. That is because one syllable is stressed and one is not. The vowel that is in the stressed syllable receives its "full" pronunciation. It is longer and louder then the vowel in the unstressed syllable. In fact the vowel from the unstressed syllable is reduced to the schwa sound. So in those examples the schwa sound is represented by an a, o, and an e.
Listen to the podcast as I read the following list of words see if you can hear the schwa. This is one of the reasons why spelling in English is so tough. It is hard to know what letter the schwa sound is being represented by. Also as a note it is perfectly acceptable and in fact standard to reduce the vowel in the unstressed syllable to the schwa. It is not considered sloppy and will make you more intelligible to the native English listener. 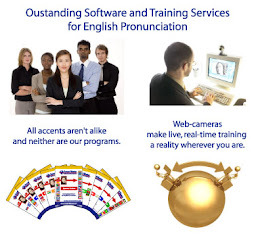 Accent Master's software has a great interactive section to help you learn this important aspect of accent reduction.